Sources say the Justice Department has been urged to investigate whether McCabe, the fired FBI deputy director, lied to federal officials. The Justice Department's inspector general has recommended a criminal investigation into whether former FBI Deputy Director Andrew McCabe lied to federal officials about a leak to a newspaper reporter. McCabe was fired in March, and last week a report from the inspector general concluded that he repeatedly lied when asked about the leak of information regarding the FBI's efforts to look into the finances of the Clinton Foundation in 2016. 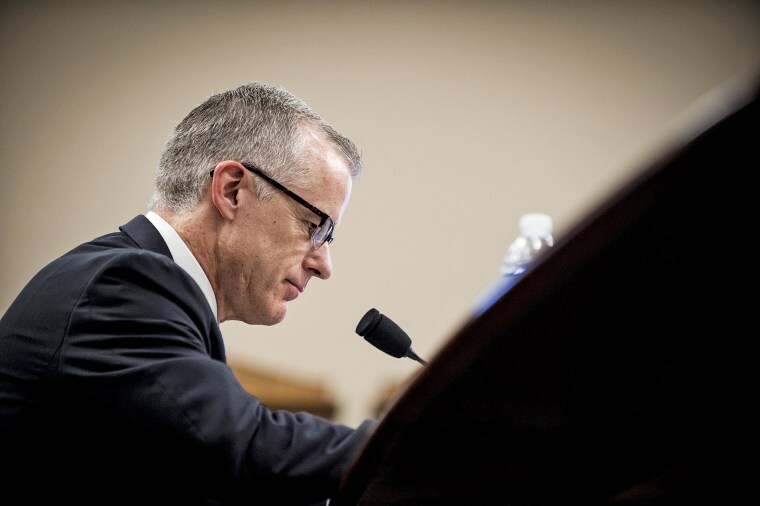 Legal sources familiar with the matter revealed Thursday that Inspector General Michael Horowitz recommended in January that McCabe be investigated on suspicion of lying. That same month, FBI Director Christopher Wray demoted McCabe from his position as deputy director. Attorney General Jeff Sessions fired McCabe 26 hours before he was to retire, concluding that he approved an "unauthorized disclosure to the news media" and, when asked about it, "lacked candor, including under oath, on multiple occasions." McCabe's lawyer, Michael Bromwich, downplayed the recommendation. “We were advised of the referral within the past few weeks," he said. "Although we believe the referral is unjustified, the standard for an IG referral is very low." Bromwich has said in the past that McCabe had full authority to authorize the release of information to the reporter, never misled investigators, and corrected the record about his answers. The inspector general's report concluded that McCabe authorized two FBI officials to tell a reporter from The Wall Street Journal that, contrary to what the reporter claimed to have heard, the FBI was not trying to delay an investigation into the Clinton Foundation. The question arose because when McCabe's wife ran as a Democrat for the Virginia Senate in 2015, her campaign received a contribution from a political action committee controlled by Virginia Gov. Terry McAuliffe, a close Clinton friend. The report said McCabe authorized the release of the information to protect his own image, not to enhance public understanding of the FBI's work. When asked about the leak, the report said, McCabe repeatedly denied being the source. Among those he misled, the inspector general said, was James Comey, who was the FBI director, and his boss, at the time. In an appearance this week on "The View," Comey said, "I still believe Andrew McCabe is a good person, but the inspector general found that he lied, and there's severe consequences in the Justice Department for lying — as there should be throughout the government." The inspector general's referral of the case to the Justice Department for possible prosecution does not mean that McCabe will be charged. The department declined to comment on Thursday.